As the Patriots were staring at a 28-3 deficit pretty deep into the third quarter I turned to a friend of mine and said, "It has to be statistically impossible for them to come back from this". Turns out, I wasn't far off. 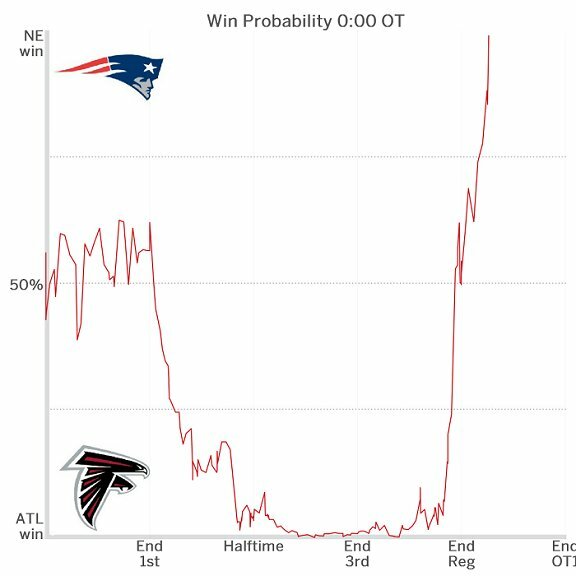 The folks at ESPN Stats & Information always calculate a team's win probability throughout the game, as you can see above, this year's Super Bowl was pretty interesting. Technically, according to ESPN, the Patriots chances of winning went as low as 0.2%. That is about as close to zero as you could possibly get. Literally everything had to go right for the Pats to pull this win out, and it did.